I think I may be the perfect age for the appeal of the finely-tooled nostalgia of The Force Awakens. The obvious target for Star Wars nostalgia is someone like J J Abrams, who saw the original films in the cinema as a child; I was too young for that, growing up in the 80s after the films had left the cinemas, but before video recorders made it easy to watch the films at home. So I first experienced the films by catching bits of them when they happened to show up on TV, or, even more, through the clouds of content thrown off by Lucasfilm’s franchising efforts (I have particularly fond memories of animated C3PO and R2D2 buddy comedy Droids). This diffuse omnipresence played brilliantly into the mythical feel the films strive for. So it’s fairly unsurprising that I enjoyed the new film, but what I hadn’t expected is that the film quite clearly dramatises this condition of franchise-dependence, and also has some quite thoughtful things to say about it. J J Abrams has already made one thoughtful film about late-70s/early-80s blockbuster film-making, Super 8, which is largely an ET reboot, so it’s not entirely surprising that he would have interesting things to say when switching from Spielberg to Lucas (it’s perhaps more surprising that his Star Trek reboot was so by-the-numbers; but Star Trek’s a different sort of franchise). But, as Lucasfilm had a bigger influence on the modern blockbuster-franchise system than Spielberg did, so The Force Awakens‘s commentary on that system is on a larger scale than in Abrams’s earlier film. Actually, the commentary on franchising in the early parts of The Force Awakens may even be a little too on the nose. 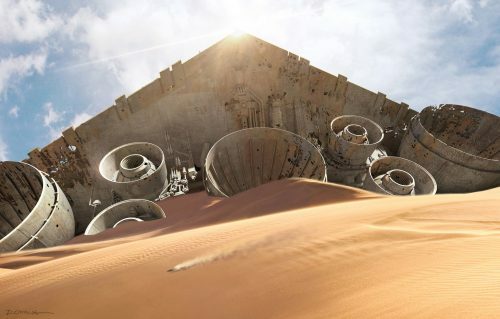 Early scenes take place in a landscape of spaceships crashed in a desert, literally among the wreckage of the earlier films. 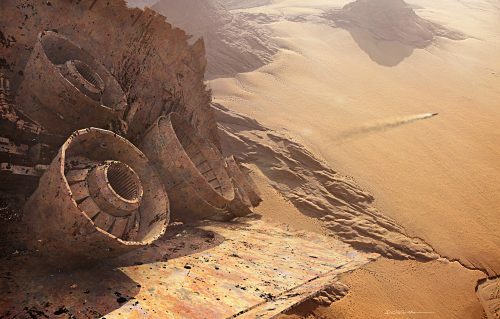 It’s interesting, though, that Abrams approaches this wreckage as an opportunity for aesthetic pleasure: the scale of the wreckage is awesome, and its elegantly decayed colours against desert landscapes are frequently gorgeous. In aestheticising this wreckage, Abrams is making explicit the pleasures that franchising provides for the audience. Franchising (particularly in decades-long multi-media franchises like Star Wars) tends to detach elements from individual works, making them pieces of wreckage we can pick up and play with for our own amusement. 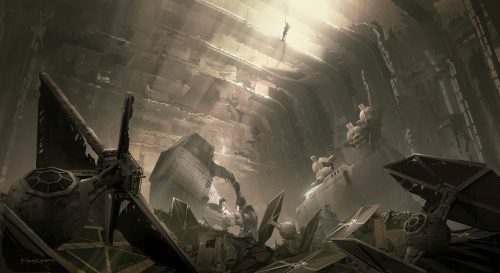 This practice of an artful re-assmbling of previous wreckage also enables what I was surprised to find was the most interesting part of the film: the villain’s narrative arc. When he’s introduced, Darth Manpain is a pretty uninteresting character, a knock-off Vader without the menace. Worse, the film seems to be setting him up for a boring and reactionary storyline, in which the pain caused by his self-doubt humanises him and leads to his redemption. Much might be said, then … about the production and deployment, especially in contemporary US society, of an extraordinarily high level of self-pity in nongay men. Its effects on our national politics, and international ideology and intervention, have been pervasive. (Snapshot, here, of the tear-welling eyes of Oliver North.) In more intimate manifestations this straight male self-pity is often currently referred to (though it appears to exceed) the cultural effects of feminism, and is associated with, or appealed to in justification of, acts of violence, especially against women. For instance, the astonishing proportion of male violence done on separated wives, ex-wives, and ex-girlfriends , women just at the threshold of establishing a separate personal space, seems sanctioned and guided as much as reflected by the flood of books and movies in which such violence seems and expression not of the macho personality but of the maudlin. (One reason women get nervous when straight men claim to have received from feminism the gift of “permission to cry.”) ― Eve Kosofksy Sedgwick, Epistemology of the Closet (145). The film continues to lead us to believe it is following this maudlin-redemptive plotline up until the climatic scene between Kylo Ren and his father. Kylo Ren confesses his moral turmoil to his father, and then thanks his father for allowing him to overcome this self-doubt, which Ren does by killing his father. The internal conflict that was causing him stress was not guilt about his evil, but worry that he didn’t have the single-minded willpower to follow through on this evil, and it is the pain this causes him which finally gives him the impetus to commit the act which cements his evil. Kylo Ren’s moral pain isn’t what humanises and redeems him, its what allows him to become a monster. It’s hard not to see this as a critique of how Anakin Skywalker was presented in the prequels, where Anakin’s surly, self-pitying sociopathy is misunderstood as tragedy. And this kind of internal critique is made possible by the aesthetic attitude to franchising that The Force Awakens takes up.